What if you came to your writing through the gateway of love, instead of fear? 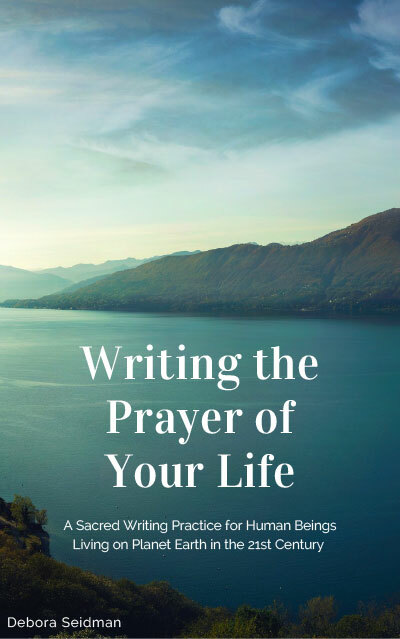 Would you like a free copy of my workbook, Writing the Prayer of Your Life? New Course Offered Through Daily OM! Did you know that you can truly feel at home in your own body, no matter what you've been through? Whether you consider yourself a writer or not, it is possible to take the details of your personal story, no matter how traumatic they may be, and write your way home to an unshakable, safe space for your soul to reside. In this 21 Day Soul Writing Journey you will learn to show up as your own witness in a profound and practical way, combining the wisdom of your words with the wisdom of your body as you work through the detailed exercises. Debora Seidman is an award winning playwright and a dedicated, compassionate teacher. For over twenty years she’s been leading body centered, spirit-based writing workshops that help her students source their creative expression in a deep connection with their own body, the Earth, and the Sacred.